Welcome to A Sampling Bee! Today, I share with you 88 Acres Farm-Raise Bars! 88 Acres creates healthy snacks that are free from the most common food allergens. 88 Acres creates these yummy bars in an allergen-free facility in Dorchester, Massachusetts. Peanuts, tree nuts, eggs, dairy, gluten, soy fish or shellfish will never be found in their facility. It is 100% free of those ingredients. Non-GMO! 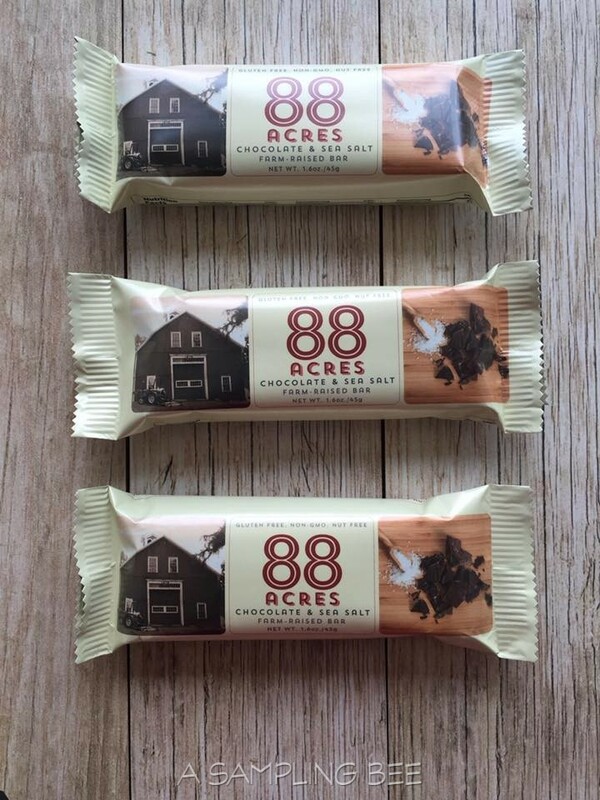 88 Acres Bars are made with only the best ingredients. 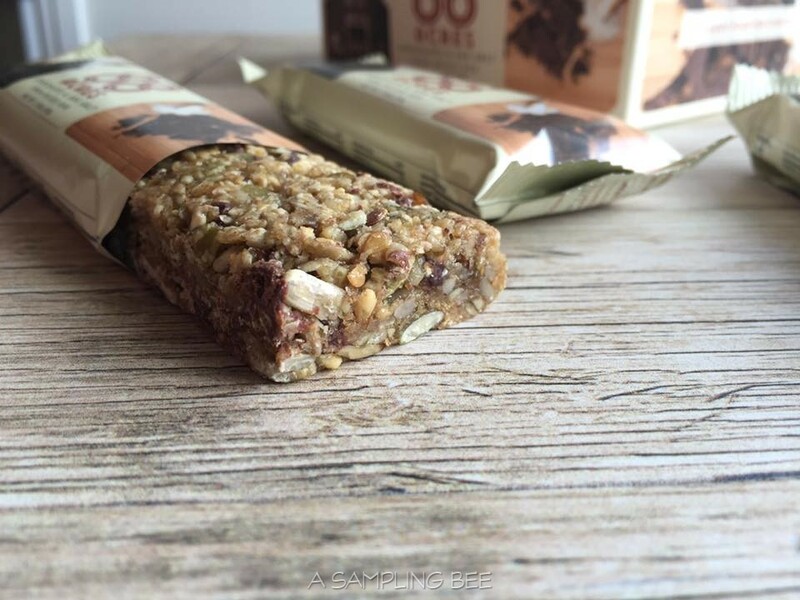 The ingredients in these bars only come from the best farmers and suppliers. Those ingredients are then used to make small batches of 88 Acres Bars. 88 Acres created a bar that can be enjoyed by all. Flavors available: Apple & Ginger, Chocolate & Sea Salt and Triple Berry. Organic sunflower seeds, organic pumpkin seeds, flax seeds, gluten-free certified oats, brown rice syrup, maple syrup, organic dark chocolate (organic cane sugar, organic chocolate liquor, organic cocoa butter, organic vanilla extract), and sea salt. Each Chocolate & Sea Salt bar contains 12 grams of sugar, 6 grams of protein, 3 grams of fiber and 22 grams of carbs. 200 calories per bar. 88 Acres sent me the Chocolate & Sea Salt flavor. Oh my are they good! 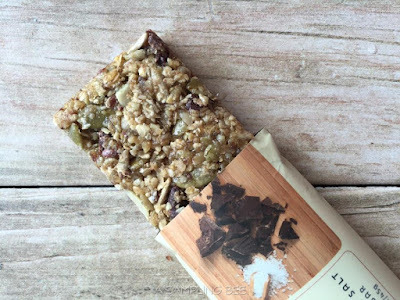 These bars are FULL of seeds, chocolate and gluten-free oats. All of which I love. The seeds and oats are crunchy. The chocolate, oats and seeds go together perfectly and there is just the right amount of each in each bar. I love eating these bars for breakfast with a hot cup of green tea. I also love them as a mid-afternoon snack! So delicious, filling and wholesome! I highly recommend these bars! I love the fact that I can pack these bars in my purse and not have to worry about eating them in public. They are completely allergy friendly. So many people nowadays have food allergies. With these, I don't have to worry. Nor do they! They are safe to pack into your child's lunchbox. 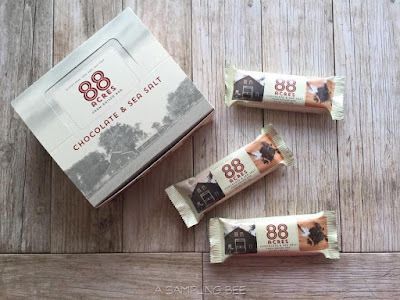 I received 88 Acres Bars in exchange for my honest review. All opinions are my own. Always! 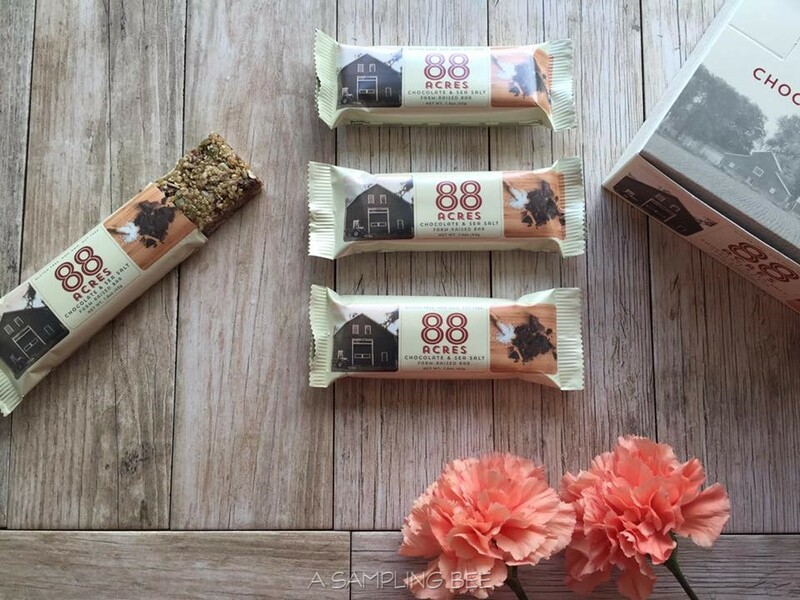 Sign-up for exclusive sneak peeks of new flavors, products, healthy eating recipes, giveaways and more at 88 Acres! This is a nice snack to have in between meals. Or a snack when you don't have time to grab an actual meal because of a busy day. I'm sure the kids will love this too. This would be my snack on the go when I got travel. What a great variety in flavors. I love to carry bars for convenience and it really makes a difference when I carry healthy ones. These sound like they would be good. Especially chocolate and sea salt! The boys look delicious I wonder what the sugar intake is on these bars because I have to watch how much I take in but they look pretty healthy and great energy. Looks like a nice treat! I love bars. Chocolate, granola, power, ice cream...anything! You're right about that purse thing, it's just easily tempting to carry one everywhere. And good thing this one's allergy free. I want some of those! 88 bars are exactly what I am looking for! Thanks for sharing your review! knowing that it is allergy friendly sounds really good! would love to try them too!